What connects our organisation? In what ways are the members of our team connected? How can we make a diverse team more aware of the value of its diversity? Some posts back, I described how I think it’s important to know how what I’m good at, the choices that I make and what I find important relates to my company’s identity (See post: “How does my personal identity compare to my organisation’s identity?“). Now, I will try to make this a little bit more practical, and propose a tool that can help me to find out more about what connects me and my teammembers and the organisation as a whole. It can be used individually or in a team, e.g. as an exercise at the beginning of a strategy/planning meeting. A word of warning: This idea is still in beta-stage, I’ve tried it myself, but not yet with a group. Dubio cube: What would success look like for me/my team/my organisation? The idea is that every side of the cube highlights a different perspective on what we are doing. One side focuses on how we do things, e.g. what methods or tools we use, while the other is about our purpose. So how does this work? 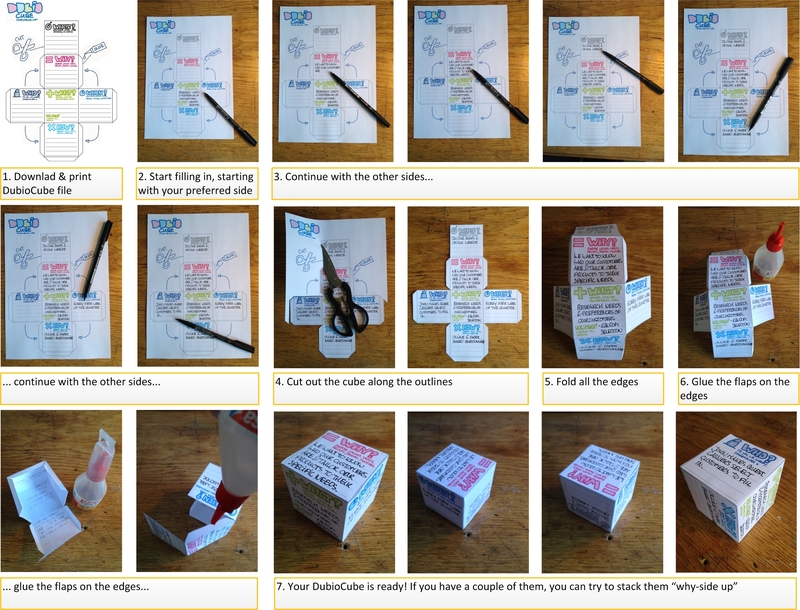 The first step is to download & print a dubio-cube (or a couple of them, say 5 per person). You can download a pdf version of the dubio-cube here, and assembling instructions here. Based on personal preference, the second step is to start filling in starting with the side of the cube that you like most. If you like, you can base what you fill in on the question “What would success look like for me/my team/my organisation”. Some people might prefer to start with the how-side, others probably want to start with the why-question (See also “What is your what-, how-, why-perspective?“). Try to fill in your chosen side with an example of a passion, need or value in case of the why-side, or a method or tool in case of the how-side. It can be any example you like, and it doesn’t have to be an example from your own job, it can also be from elsewhere in the organisation. After you filled in your preferred side of the cube, continue filling in the other five sides if you can. Some will be hard, but try to -at least- fill in the what-, how- and why- sides. Additional question for the what-side is “how much?”. Try to make the what a bit more specific by adding words like a few, nothing or everything. Don’t think too long about it though. If you like, repeat steps 1-3, and fill in more cubes, up to the point that you have at least five cubes. To stretch yourself a bit, you can try to have a different starting-side for a couple of cubes. Next, cut out your dubio-cube(s) along the outlines. Now fold all the edges of the cube to prepare the assembling. Put some glue on the flaps on the edges of the cube, and assemble it. If you have a couple of cubes on similar topics (e.g. from different members of one team), you can try to figure out if you can find cubes that have a connection with another cube (can be your own, or that of a team member). Do we have a match? Or do some different how’s lead to the same what? You should be able to place them next to or on top of each other based on their connecting sides. 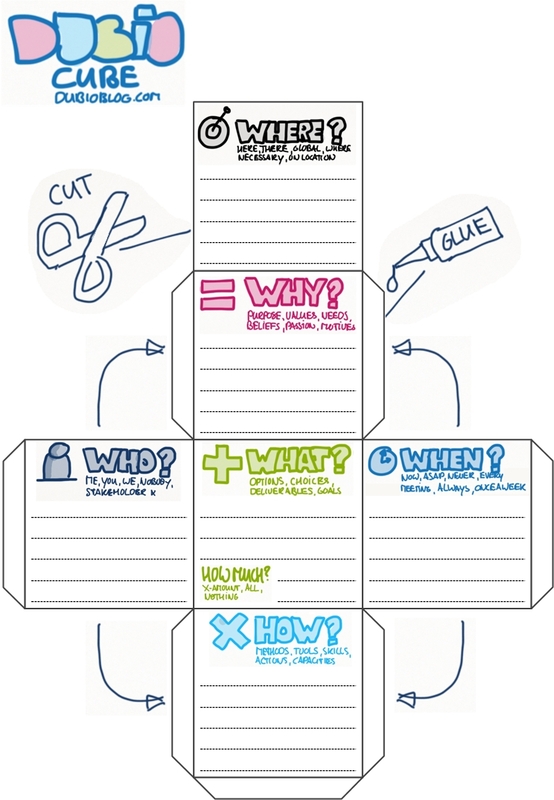 If you always put the why-side up, each layar you put on top of the first will lead you closer to your team’s purpose. Just keep on asking why. Probably you can extend the exercise by trying to make as many layars as possible. Ideally, I think this exercise should lead to a pyramid or triangle shaped building that represents your team’s strategy. See post “A hierarchy of questions” for further explanation on this. Q: Dear reader, what do you think of this idea? Do you think you would be able to build ‘a pyramid‘ that represents your team’s strategy?